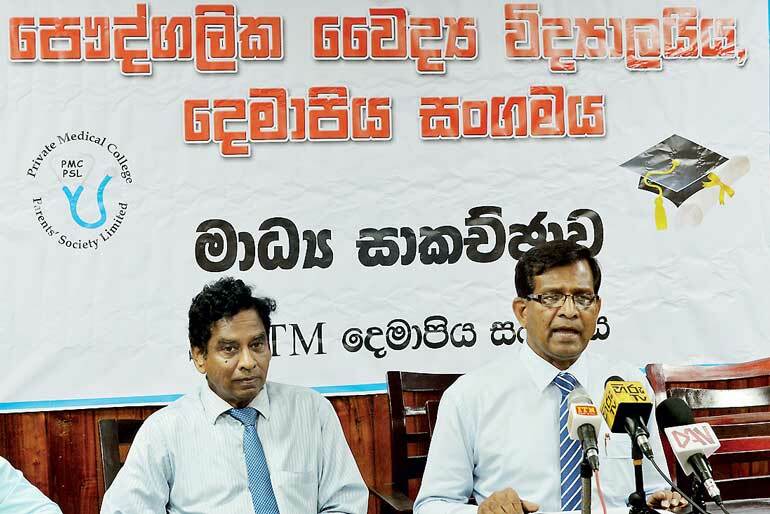 The Private Medical College Parents Society Limited (PMCPSL) yesterday urged that SAITM be converted to a government institute, as that is the only fit solution for the students who are suffering. At a media briefing, the PMCPSL stressed on the plight of the 900 students, as they are undergoing many difficulties such as mental stress, personal problems and so forth, as a result of them being unable to complete their studies and continue with their life ahead. According to the PMCPSL, the Government keeps making empty promises, as up-to-date no solution has taken place for these medical students. As per the PMCPSL, the Government promised to resolve the SAITM issue before 31 December 2017, and then came up with the solution of converting all SAITM students to the Sri Lanka Institute of Information Technology (SLIIT), but yet these pledges remains unfulfilled. As the agreement for the students to be transferred to two new institutions under SLIIT, which is a non-profit organisation, did not prove of any success, the PMCPSL believes that the only solution left that is of benefit to the students is to convert SAITM to an institute under the Government. If no action is to take place within the course of two weeks, the PMCPSL together with their children have taken oath to go on strike and starve unto death. “We are done with waiting patiently and ask that the President and his Government take immediate action towards solving the problem. Just imagine the pain and difficulty the students and their parents face, when these children who have been studying for nearly 10 years are left with no hope of a better future,” said Dr. Tennakoon. Likewise, he also reiterated that SAITM students are as competent as their state university-educated counterparts, and are prepared to sit for a common paper to prove their educational competence level. He stressed on the fact that there are even students with three As in the bio stream who do not get selected to the Government universities due to the district quota system. There are many such SAITM students and they are equally educated and gifted, he stated. “We ask that the Government immediately converts SAITM to a state-owned institute and help these innocent students complete their education in a healthy and fruitful manner. We have come to the resolution that this is the only way these students can finish their education and lead a successful and happy life in the future,” Dr. Tennakoon concluded.